Sixty-two-year-old widow and Sunday School teacher Maggie Dove has opened a detective agency along with her two friends, Agnes and Helen. Sleepy Darby-on-Hudson does not seem to be particularly fertile ground for a detective agency and the ladies have had no clients. But when Racine Stern comes to the office with a problem, Maggie is ready to spring into action. The Stern family is the wealthiest in the village and the most reclusive. Racine has given the last 40 years of her life over to caring for her ailing mother. She is distraught that her younger sister, Domino, is returning for a visit. Domino, who married a rock star has been tabloid fodder for years. Racine says that Domino is evil, a witch, and she wants Maggie to keep her from coming. It's too late though and Domino returns with the rock star, her son, and an entourage. When Domino plummets from a balcony at the "welcome home" Halloween party she throws for herself, is it suicide, an accident or murder? There is a lot more going on in the village than Maggie ever knew, including a coven of witches. 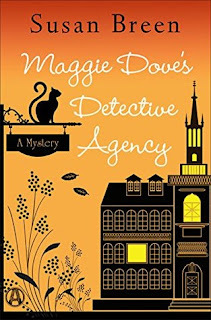 I received an advance digital copy of Maggie Dove's Detective Agency in return for an honest review. I was not aware that it was the second in the series and feel that I might have had a more positive reaction had I read the first. While I like Maggie as a character, the book was much more Sunday School than sleuth. That being said, I was completely surprised by the solution and found the book interesting overall. I am intrigued enough to read the first in the series, Maggie Dove, if only to discover how these three very different women came to open a detective agency. Thanks to NetGalley and Alibi.